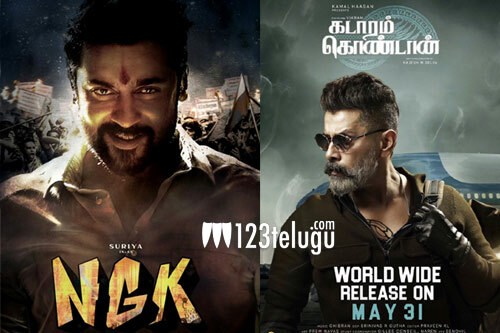 This May, the Tamil film industry and fans of leading stars Suriya’s and Vikram will be witnessing an epic clash, as Suriya’s NGK and Vikram’s Kadaram Kondan are set to hit screens on the same day. Both the movies will be released on May 31. While NGK is an intense political drama, Kadaram Kondan is a slick action thriller. Both the movies have been in the making for a long time and expectations on them are quite high. Incidentally, NGK makers had announced the film’s release date last month. On the other hand, Kadaram Kondan’s team made the film’s release date official yesterday, leading to the clash. It remains to be seen whether both the movies will lock horns with each other or one of them will be pushed to a later date eventually.